The Silver – and First – King, Shiro, has returned to Tokyo – after the death of his old friend, the Gold King. Now there is one less King in the world to protect the Dresden Slate. For the Dresden Slate holds the key to the powers of the Kings and their clans – but it’s being kept safe under the watchful eyes of the Blue Clan, SCEPTER 4. However, the sudden reappearance of the Green King, Nagare Hisui, and his Green Clan JUNGLE, leads to an all-out attack on the tower where it’s located. The Red, Blue and Silver Clans bury their differences and unite to try to prevent the Green King from carrying out his plan to steal the Slate and unleash a worldwide revolution. 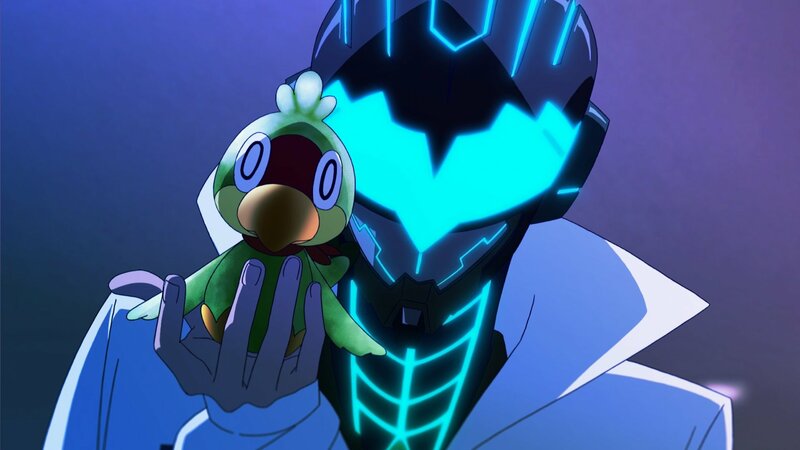 This third anime outing for GoRA and GoHands’ K Project, follows directly on from K: Missing Kings and shows the same strengths and problems as the earlier two. It still looks amazing (although many of the location stills are the same) and the underlying story (aspiring to become a contemporary mythos of its own) is undeniably intriguing. There is, of course, a danger with a story like this that it becomes too weighed down by its own mythology and after an exciting beginning the series sags badly in the middle – but then redeems itself by building to a nail-biting and satisfying ending. Satisfying because it delivers the dazzling action we’ve come to expect from this series but also because it doesn’t neglect the characters we’ve come to care about. The stresses put on the love-hate friendship between skateboarding punk Misaki Yata of Red Clan HOMRA and cynical Saruhiko Fushimi of SCEPTER 4 draw the viewer in and the little family of cat-girl Neko, swordsman Kuroh and their beloved King, Shiro, is as touching as ever. But the problems are still here too: the fan service is so ridiculously OTT in places that, frankly, it’s funny. (I’m referring to the ridiculously well-endowed Lieutenant Seri Awashima whose earnest and likable character is utterly submerged beneath the weight of her boobage. The extraordinary contortions the animators put her through when she’s wielding her sword in battle are Just. Not. Believable. The character designs by Shingo Suzuki (Mardock Scramble, Coppelion) are attractive yet strangely lacking in expression; faces are often blank and doll-like. This means that the voice actors have to do so much more to make their characters come alive. The series boasts a great deal of 3DCGI and I’d rather seen more attention paid to animating the humans and their reactions (the jokey robot janitors at the High School were never very funny in the first place and strike a wrong note here). The US dub script is more than a little portentous in places, leading to clunky dialogue delivered with strange pauses to get the lip-flap right. A shame, because Sam Regal is still a very likable Shiro. Stephanie Sheh is the best Neko; she adds much more nuance than her Japanese counterpart, the usually excellent Mikako Komatsu (Kanae in Classicaloid) and Johnny Yong Bosch has all the snark as Fushimi. 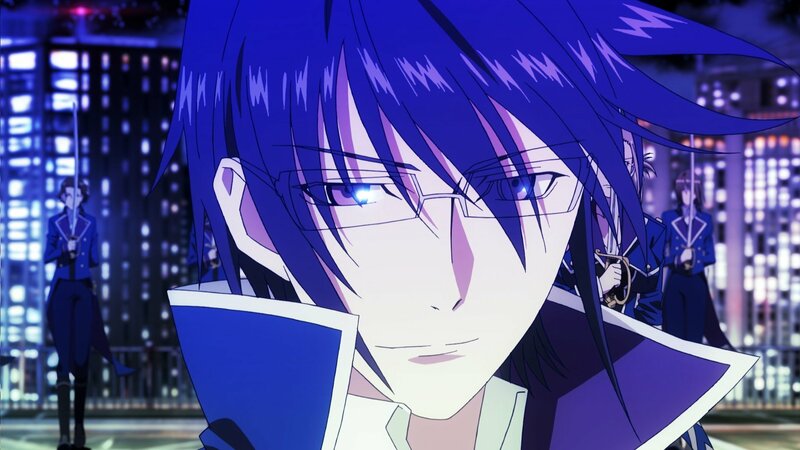 But Patrick Seitz is miscast as Captain Munakata; Tomokazu Sugita inhabits the role of the Blue King with more humanity as he faces up to the imminent loss of his powers. In fact, the Japanese cast win overall – and if only the subtitles were not white (again!) and often so difficult to read against a light background, the original dub would be my first recommendation. 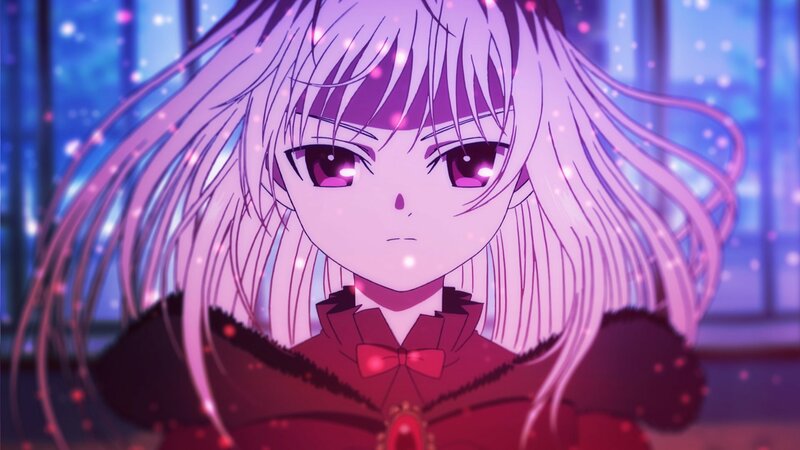 On the music front, the Opening Theme is “Asymmetry” by Yui Horie, Anna Kushina’s voice actress, and the Ending Theme is “Solution” by CustomiZ; of the two, “Solution” makes a striking, dramatic finale to most episodes which suits the mood of increasing tension and doom really well. There’s a new song from angela “Kizuna” to conclude the thirteenth episode, matched with drawings showing snapshots of the clans after the events of the final episodes. The music by Mikio Ende is more of the same. You’ll either love it or hate it. I still feel that by running a drum track underneath most of the animation and underscoring everything with a similar and ongoing beat, it saps many scenes of their dramatic impact. 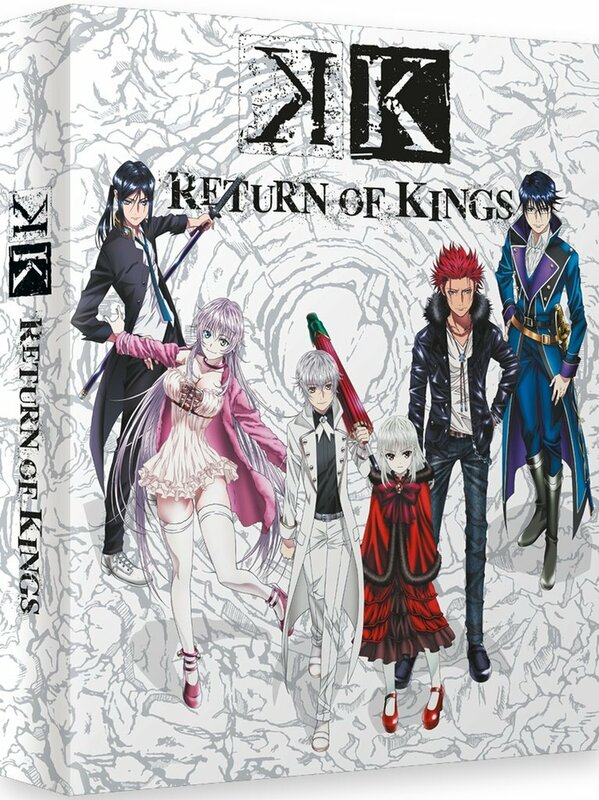 K: Return of Kings has been brought to R2 by Anime Limited; there is a limited Collector’s Blu-ray Edition with a poster and art cards and also a simple release on DVD. The extras are textless Opening and Ending songs and trailers. 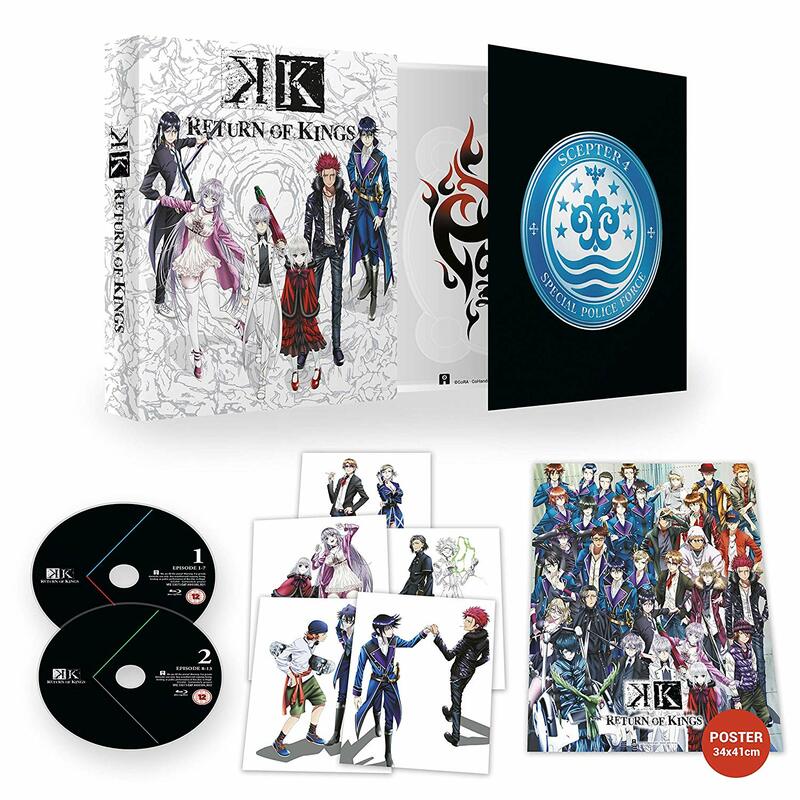 Fans of K Project will not want to miss this tense continuation of the story of the Kings and their loyal clans. In spite of the issues I’ve mentioned above, the cumulative power of the story-telling and the dazzling visuals make this worth a watch. And GoRA and GoHands have not been idle; their latest releases in Japan in the K Project are a series of seven films, not all yet released in Japan. MCM London has gone and passed, but there’s a lot of news/updates going around. Here’s a recap of everything from May to mid-June 2018! The distributor has now revealed what is in store for the remainder of 2018. 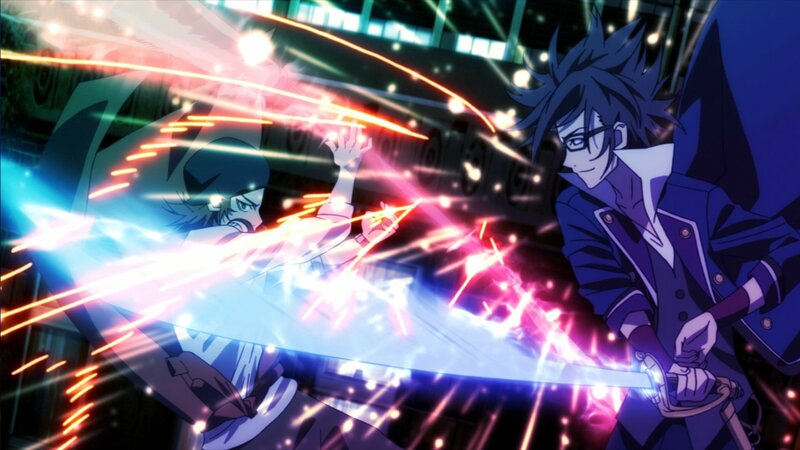 K: Missing Kings looks gorgeous but is not the best place for newcomers to the K-Project to start. So – is it a satisfying watch for fans of the original series? More listings have cropped up for Anime Limited’s Q4 slate including collector’s edition sets!